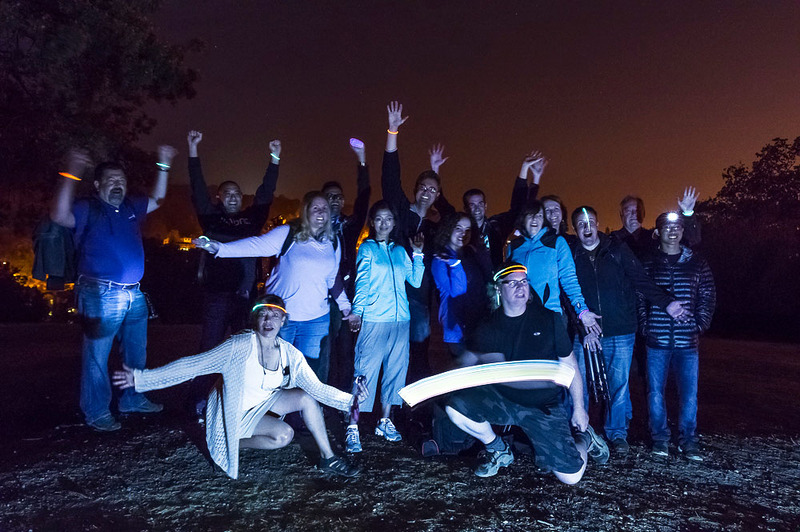 Teaching people to photograph the stars in the night sky is such good fun for our Aperture Academy instructors because of the pleasure we have when our students realize their cameras can capture some wonderful magic not seen with the naked eye. So it was that on two early August evenings, professional photography instructors, Jean Day and Matt Granz gathered at the Aperture Academy Gallery with two separate groups of students eager to learn these new skills. 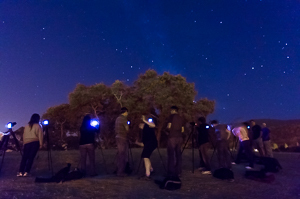 As with all our workshops, we began with introductions to allow everyone to get to know each other and for our instructors to get an idea of student's skill levels, what camera models and lenses they had with them, and if there was anything in particular they wished to practice to better help them with night photography. Jean and Matt then led everyone through a PowerPoint presentation outlining the techniques they would be using throughout the evening including the importance of using manual mode to set shutter speed, aperture, and ISO, giving everyone complete control over their cameras and optimize their images of the starry sky. Following a short classroom instruction, everyone loaded up with their gear in our 13 passenger Aperture Academy van and headed off to a shooting location south of San Jose. Summer nights in California are usually quite clear, but a little monsoonal weather brought the added bonus of a few clouds to go streaking through our students images over these longer nighttime exposures. Each group arrived at their destination with time to set up and capture the last bit of color from sunset and to begin getting their lenses focused at infinity for clear, sharp stars. Jean and Matt then went about helping everyone with composition and fine tuning their exposures as the stars began to show. Set up on a hillside, we use a group of oak trees bathed in the ambient light of a surrounding neighborhood as foreground. When everyone was ready and tripods steady, we started with instruction of 30 second shots to test for focus and a composition that worked for each particular set up. Once everyone had their settings dialed in, they were instructed on how to choose a cooler white balance to keep the sky looking blue while toning down the warmer ambient light absorbed by the oak trees. Now it was time to get successive shots of 30 seconds over a 5 minute period which would give students a sample of images to learn the layering technique for creating star trails. Next, Matt and Jean helped their students in adjusting ISO and aperture to do multiple minute shots in bulb mode while using their shutter release cables. Exposures of 5 and 10 minutes were used to show the difference these longer shots can make in lengthening the light of the stars as the earth orbits through the solar system all while maintaining a properly exposed foreground. Jean and Matt had fun between these lessons doing some light "writing" with flashlights or LEDs to show students how easy it is to incorporate some cool light painting into their shots. 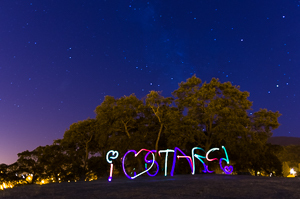 Everyone enjoyed getting images with the word, "STARS" or "DARKSIDE" as well as some goofy swirls of light Matt had fun creating as he ran before the cameras. Some students even had the opportunity to get a ghost shot of Jean lit up with one of Matt's purple gels which he puts over his flashlight. With the evening drawing to a close, students took time to get a few final shots using their new skills, and for our instructors to field some additional questions on shooting the night sky. At last, Jean and Matt took a little time to get some group shots with students to commemorate these workshops before loading back up in the van and heading back to the gallery. Armed with some new experiences with star photography and a hand-out to reinforce and reference the basics on photographing the stars, everyone said their good-byes for now on these two balmy, August summer nights.